A kiwi is any of the species of flightless birds endemic to New Zealand of the genus Apteryx (the only genus in family Apterygidae). The kiwi is also a national symbol of New Zealand. 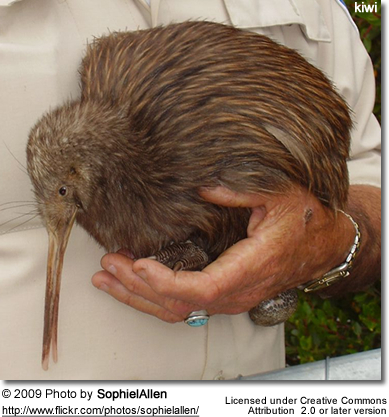 The kiwi lays the largest egg in relation to its body size. At around the size of a domestic chicken, kiwi are by far the smallest living ratites. All kiwi species are endangered. There are five accepted species (one of which has four sub-species), plus one to be formally described. The largest species is the Great Spotted Kiwi or Roroa, Apteryx haastii, which stands about 45 cm (17.7 inches) high and weighs about 3.3 kg. (Males about 2.4 kg) It has grey-brown plumage with lighter bands. The female lays just one egg, with both sexes incubating. Population is estimated to be over 20,000, distributed through the more mountainous parts of northwest Nelson, the northern West Coast, and the Southern Alps. The very small Little Spotted Kiwi, Apteryx owenii is unable to withstand predation by introduced pigs, stoats and cats and is extinct on the mainland because of these reasons. About 1350 remain on Kapiti Island and it has been introduced to other predator-free islands and appears to be becoming established with about 50 'Little Spots' on each island. A docile bird the size of a bantam, it stands 25 cm (9.8 inches) high and the female weighs 1.3 kg. She lays one egg which is incubated by the male. The Rowi, also known as theOkarito Brown Kiwi or Apteryx rowi, is a recently identified species, slightly smaller, with a greyish tinge to the plumage and sometimes white facial feathers. Females lay as many as three eggs in a season, each one in a different nest. Male and female both incubate. Distribution of these kiwi are limited to a small area on the west coast of the South Island of New Zealand, however studies of ancient DNA have revealed that in prehuman times it was far more widespread up the west coast of the South Island and was present in the lower half of the North Island where it was the only kiwi species detected. The Stewart Island Tokoeka,Apteryx australis lawryi, is a subspecies of Tokoekafrom Stewart Island. The Haast Tokoeka, Apteryx australis ?, is the rarest species of kiwi with only about 300 individuals. It was identified as a distinct form in 1993. It only occurs in a restricted area in South Island's Haast Range at an altitude of 1,500 m. This form is distinguished by a more strongly downcurved bill and more rufous plumage. The Northern Fiordland Tokoeka (Apteryx australis ?) and Southern Fiordland Tokoeka (Apteryx australis ?) live in the remote southwest part of South Island known as Fiordland. These sub-species of Tokoeka are relatively common and are nearly 40 cm (16 inches) tall. The North Island Brown Kiwi, Apteryx mantelli orApteryx australis before 2000 (and still in some sources), is widespread in the northern two-thirds of the North Island and, with about 35,000 remaining, is the most common kiwi. Females stand about 40 cm (16 inches) high and weigh about 2.8 kg, the males about 2.2 kg. The North Island Brown has demonstrated a remarkable resilience: it adapts to a wide range of habitats, even non-native forests and some farmland. The plumage is streaky red-brown and spiky. The female usually lays two eggs, which are incubated by the male. Analysis of mitochondrial DNA, ecology, behaviour, morphology, geographic distribution and parasites of the North Island Brown Kiwi has led scientists to propose that the Brown Kiwi is three distinct species. The North Island Brown Kiwi; the Okarito Brown Kiwi (Rowi), whose distribution is restricted to a single site on the West Coast of the South Island of New Zealand; and a third distinct population of the North Island Brown Kiwi, the Southern Tokoeka, distributed in the in lowland forest to the north of Franz Josef glacier in the South Island and on Stewart Island/Rakiura, with a small population near Haast being another possibly distinct species, the Haast Tokoeka. Prior to the arrival of humans in the 13th century or earlier, New Zealand's only endemic mammals were three species of bat, and the ecological niches that in other parts of the world were filled by creatures as diverse as horses, wolves and mice were taken up by birds (and, to a lesser extent, reptiles). Kiwi are shy and usually nocturnal. Their mostly nocturnal habits may be a result of habitat intrusion by predators, including humans. In areas of New Zealand where introduced predators have been removed, such as sanctuaries, kiwi are often seen in daylight. They prefer subtropical and temperate podocarp and beech forests, but they are being forced to adapt to different habitat, such as sub-alpine scrub, tussock grassland, and the mountains. Kiwi have a highly developed sense of smell, unusual in a bird, and are the only birds with nostrils at the end of their long beak. Kiwi eat small invertebrates (i.e., insects), seeds, grubs, and many varieties of worms. They also may eat fruit, small crayfish, eels and amphibians. Because their nostrils are located at the end of their long beaks, Kiwi can locate insects and worms underground without actually seeing or feeling them, due to their keen sense of smell. Once bonded, a male and female kiwi tend to live their entire lives as a monogamous couple. During the mating season, June to March, the pair call to each other at night, and meet in the nesting burrow every three days. These relationships may last for up to 20 years. They are unique among other birds in that they have a functioning pair of ovaries. Kiwi eggs can weigh up to one quarter the weight of the female. Usually only one egg is laid per season. The kiwi lays the biggest egg in proportion to its size of any bird in the world, so even though the kiwi is about the size of a domestic chicken, it is able to lay eggs that are about six times the size of a chicken's egg. Eggs are smooth in texture, and are ivory or green-ish white. The male incubates the egg, except for the Great spotted kiwi, A. haastii, where both parents are involved. The incubation period is 63–92 days. Producing the huge egg places a lot of demands on the female. For the thirty days it takes to grow the fully developed egg the female must eat three times her normal amount of food. Two to three days before the egg is laid there is little space left inside the female for her stomach and she is forced to fast.